Also Known as Devil’s Rock, Grisly Rock and Llads-Lowe Balder, Great Rock is a large outcrop of natural rock on the edge of Staups Moor. 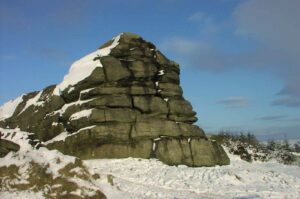 It is made from Kinderscout Grit, a variant of Millstone Grit. This substance was formed millions of years ago, when coarse sandstone and shale were deposited from vast river deltas flowing into a shallow sea, which covered the region at the time. This is the same stone which may be seen locally at Bride Stones and Whirlaw Stones. It also underlies the village of Heptonstall. Later, after the vast chain of Pennine Hills was thrown up, erosion by millennia of water, weather and glaciation stripped the Kinderscout Grit from the valleys, only leaving it visible on the remote hill tops. Great Rock is carved with names, dates and symbols, left over the years by its countless visitors. Viewed through modern eyes, this may appear as simple vandalism, but it clearly illustrates the impact that this special location has had on both local people and visitors. Writing in 1844, local poet William Dearden makes several references to Great Rock. In his lengthy opus ‘The Vale of Caldene’, Dearden describes, “the time-hallowed form of wild Llads-Lowe Balder”. It is likely that Great Rock’s imposing profile has long made a deep impression on local humans. As a result, there are many dark stories of druidism, witchcraft, pagan worship and ritual slaughter. It is claimed that the rock was a popular venue for cockfighting. As late as the early twentieth century, there are rumours of forty people attended a cockfight called ‘The Wars of the Roses’. According to local legend, the devil wagered with God that he could step from Stoodley Pike all the way across the Calder Valley to Great Rock. He couldn’t make it, but – it is said – the marks of his hooves can be clearly seen on the rock (!). Please note: SHED produces a series of cards and the one for 2010 features ‘Great Rock’. Packs of cards are available from usual outlets in the area or by emailing: shed [at] stevenorth.com (edited to prevent SPAM, please replace ‘at’ with @). Photo by Monica Haley, 2010.